Artisanal Spanish cheesemakers, forced underground by Franco, are back from near extinction. Writer Nancy Harmon Jenkins visits their champion, Enric Canut, the cheese revolutionary turned ambassador who seeks out top small producers in every corner of Spain and introduces their work to the world. The F&W Test Kitchen creates eight spectacular recipes that celebrate his success. If you've been in a good cheese shop lately, or confronted the growing number of cheese selections at top American restaurants, you've undoubtedly encountered new Spanish choicesluscious, oozy Torta del Casar from Extremadura; creamy Monte Enebro from Ávila; sweet, mild Tetilla from Galicia. But are they really new, or just new to America? One man who has the answer to this question is Enric Canut, an engaging and energetic Catalan who is a tireless ambassador of Spanish cheeses; it would not be an exaggeration to give Canut major credit for what seems like a cheese explosion. But Canut has not just introduced artisanal Spanish cheeses to Americanshe has pioneered them in Spain as well. "I'm 48 years old and for 28 years I work in cheese," he says proudly. During that time, a revolution has taken place in Spanish cheesemaking and Canut has been at its heart. He recently told his story over a platter of (what else?) cheese, at Tutusaus, a splendid small artisanal cheese shop in Barcelona. "I was born in Barcelona," Canut said, "but my family came from the high Catalan Pyrenees and I always wanted to go back to the land and farm." With this in mind, he studied agricultural engineering in Barcelona and, to prepare his thesis, went to Holland to see how artisanal cheeses were produced. "I mucked stalls and I made cheese," he said cheerfully, "and it was more fun to make cheese than muck stalls." Then in 1978, Canut was hired by the organizers of Alimentaria, the food fair held in Barcelona every two years, to survey Catalan cheeses. At the wheel of a rickety, old hand-cranked Deux Chevaux, he covered more than 7,000 miles of axle-breaking mountain roads in that first excursion, at the end of which he delivered the Deux Chevaux to an auto graveyard and set up a stand at Alimentaria to show his countrymen and the world the marvels he'd found in hidden valleys and mountaintop pastures in just one province of northeastern Spain. "Except for those from three big cooperatives, these cheeses were all illegal," he recalled. Illegal? What made these cheeses illegal? Today's issues concern the safety of raw-milk cheeses, but back then, cheesemakers in Spain faced a very different problem. "After the Civil War and World War II, for a long time Spain was a very poor country," Canut said. Technocrats associated with Opus Dei, the conservative Catholic organization that was particularly powerful under the dictatorship of Francisco Franco, required industries to work to minimum production standards. "They said, 'We don't need producers of 50 kilos of milk a day; you work 10,000 liters a day or you don't work at all.' "
The result was predictable: Spain's artisanal cheesemakers either gave up or went underground. And some traditional cheeses disappeared altogether. With the return of democracy in the 1970s and the rescinding of the industrial-quota legislation in the late 1980s, artisanal cheesemaking slowly recovered. Canut began teaching courses in the cheesemaker's craft, in Catalonia and in other parts of Spain. He even helped to reinvent one traditional Catalan cheese that had disappeared, Garrotxa, long produced in the rainy mountains north of Barcelona. Canut had been approached by a small cooperative that was looking to make cheese from the 500 liters of goat's milk they produced each day. Talking with the grandmother of one cooperative member, Canut researched traditional cheesemaking methods; at the same time he introduced a new technique of washing the curds to make a sweeter, more gently flavored cheese. But there seemed to be a problem with this revived Garrotxa. "The first time the cheeses developed a blue fungus on the outside, and we washed it off," he recalled. "And then it grew back, and we washed it off again. And finally the grandmother said: Well, of course, in this climate it always develops that mold." He looked momentarily chagrined. "I had forgotten to ask about that," he said. Garrotxa, covered in this signature blue-gray mold, became such a success that 40 percent of it is now sold elsewhere in Spain or exported to the rest of the world. Canut's zeal for cheese remains unflagging. Today he supervises a cooperative of five farmers in the Catalan Pyrenees who make eight fine raw cow's-milk cheeses, including the aromatic Tou dels Til.lers and the pressed-curd cheese Serrat del Triadó. (Canut is also a purchasing manager of Vinoseleccion, a society for people interested in buying excellent Spanish wines, cheeses and other fine foods.) 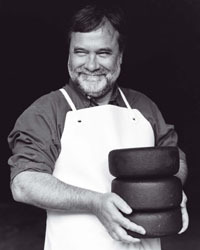 He has published several books about Spanish cheeses, including Los 100 Quesos Españoles (The 100 Cheeses of Spain), documenting distinctive cheeses made throughout the country, from Murcia in the southeast corner up to the coasts of the Basque Country and Galicia. The most exciting area right now, he believes, is the Picos de Europa, a mountainous national park that stretches across Asturias and León. "I call it the national park of cheeses," he says. "There are at least 20 different great cheeses in that one small region alone." If that's good news for Spanish cheese lovers, it's great news for American ones, as more and more of these extraordinary cheesesextraordinarily varied and of extraordinary qualityarrive in the United States. Enric Canut's Spanish-language book, Los 100 Quesos Españoles, is available in the U.S. through Murray's Cheese; 888-692-4339 or murrayscheese.com. Nancy Harmon Jenkins frequently travels to Spain, leading wine and food tours for the Culinary Institute of America. For details, go to worldsofflavor.com.